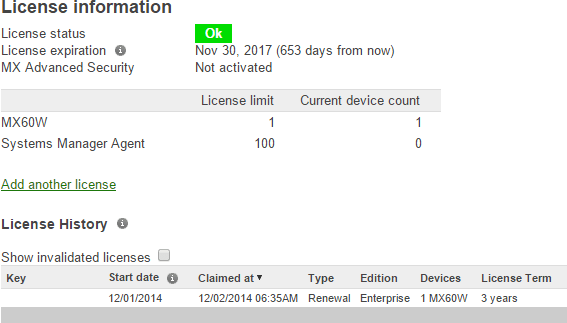 I received an email asking for details as to why I replaced my Untangle whitebox with a Meraki MX60 security appliance. For those familiar with my lab, this is something I went about doing a little less than a year ago during a lengthy lab refresh. Each time I forklift the security appliance I try to get some significant gains, such as when I migrated from SmoothWall to Untangle. Untangle is a snazzy and free Linux-based firewall and services device. Using a shopping cart like experience, one can pluck a variety of free and paid applications and drop them on the device. I personally run the virus blocker, spyware blocker, firewall, IPS, and IPsec VPN apps for my home lab on a baby sized Atom box that, although many years old, still purrs like a kitten. This strikes me as rather impressive, since the box is on 24/7 and was built using COTS (commodity off-the-shelf) hardware. With Untangle, the main complication was their pricing model for enterprise-y features. Chief among them was site-to-site tunneling and client-side VPN, which were always a bit ghetto on Untangle but things I really needed. The complete licensing package for Untangle is just over $500 US per year, which is too rich for my blood. Rather than specing out another whitebox, I realized I was a bit tired of being the support person for hardware and have been actively seeking solutions that are turn-key, such as my Synology and ioSafe arrays for storage. Most of the security appliances in the market seemed too watered down (home usage) or more like a pet project that required far too much time investment. I value time as one of the most precious and valuable commodities, especially for a device that literally allows me access to the Internet. Meraki had made a splash in the market well before Cisco bought them. The idea of having a security appliance that I could fully manage from anywhere was very attractive because I travel frequently. And the MX60w supported the entire gauntlet of features I needed for half the cost of Untangle’s annual license. It’s also a wireless access point, which I use to connect my infrastructure devices (Nest, Sonos speakers, and the like). 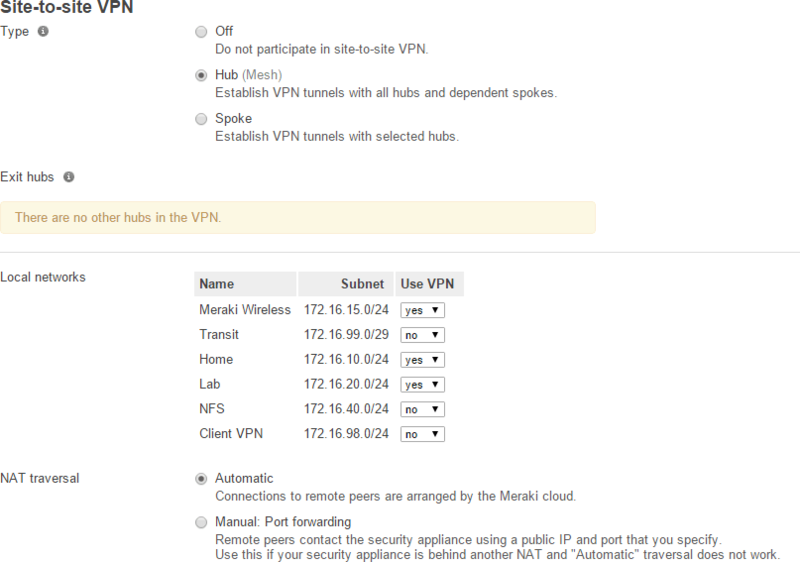 The VPN tunneling is intuitive, easy to setup, and auto-magic when connecting to other Meraki devices. The per-client visibility is nice to see what’s eating up bandwidth, or determine if something is being too chatty. Being able to control the device over the web or mobile app is incredibly clutch, allowing me to manage several devices from a single account. Another time saver is having Meraki automatically handle all of my schedule maintenance for me. I can select when it’s OK to push code, and what level of code I want – stable or beta – and they do the rest. As an example, I’m scheduled to get the next round of firmware on February 27th. I’m guessing there are better devices out there that meet someone else’s design requirements. Meraki met mine and I’m very pleased with the device. As a reminder, each environment’s functional design is going to be unique in some ways, so I don’t believe there is a “best way” when it comes to hardware. Buy what makes sense for you, as I did, and go forward from there. Enjoy! Thx for this write up Chris! I meant to ask you more about this when we met briefly at VMworld 2015. I am considering the MX64W…I would love the full security license (with IDS/IPS support) but that is just too pricey. I and curious as to which license you’ve purchased for your device and the cost for that license? Thanks for the background Chris. I’ve been very happy with my Untangle box. I purchased a small appliance from Nexgen Appliances. Mine is a dual-Intel NIC Jetway fanless mini-pc box with a quad core Intel Celeron N2930. Until recently I was able to live happily with the free modules. The cost for the licensed modules was a bit off-putting for home lab use. But I now find the need for an IPSec connection. Just as I was about to throw in the towel on the Untangle for the cost concerns you described I noticed that Untangle now offers a home license for the complete suite that’s hard to beat. $5/month $50/year $140/3-years or $200/5-years. My current challenge is to extend my home lab environment into an Amazon Web Services Virtual Private Cloud. The Untangle IPSec module doesn’t appear to be a simple dance partner for AWS IPSec. I’m currently trouble shooting the connection and am not yet ready to give up. If I fail I will either look to run the Untangle behind another router that provides more seamless integration with AWS IPSec or I might just replace the Untangle box with something else, which is why I’m really curious about your experiences with the Meraki. I note that the Meraki doesn’t appear on the list of devices shown by AWS as being known to work well with AWS IPSec and for which Amazon provides configuration detail. Do you have any experience using the Meraki to connect with an AWS VPC? Indeed. Meraki to AWS and Azure both work like a charm via the “Non-Meraki Peer” configuration. Just be careful when configuring which networks to present in the “Availability” section – the “all networks” thing is a common gotcha. I explicitly list out the subnets that I want to reach, because wildcards can cause the tunnel creation process to fail. I’m still a huge supporter of Sophos. If you are fine using your own hardware then you can use their full firewall for free for home use (physical and/or virtual). I actually run my Sophos firewall as a VM so hardware isn’t an issue since I’m already using the same for my other VM’s. If you want a physical box, then they have that as welll, but then you will run into more of a cost. I tried Meraki’s out before Sophos and I didn’t like that the box is basically dead if you don’t renew the subscriptions (doesn’t even just become a straight stateful firewall), no shell access, limited troubleshooting tools, etc. I will give them credit with the integration with the Systems Manager agent for visibility into clients. Great blog, thank you! I also use Untangle on a $50/year home license, and have it for my parents as well. It runs as a VM on my free ESXi server.